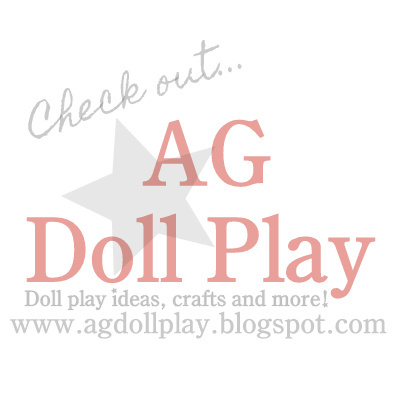 American Girl Doll Play: Camp Doll Diaries! We are so excited to be attending summer camp this year at Camp Doll Diaries! This weekend we prepared by creating our banner for camp, hanging up camp signs, making a camp shirt and having the dolls fill out their registration forms. Kristen is our camp leader so she helped the other girls by passing out forms, making sure they all had the right ones and helping with any questions they might have had when filling them out. First to arrive to camp was Rebecca...she was a bit nervous, this is her first time attending camp so she's a bit unsure of what it's all about. As soon as other friends started arriving though she started feeling more comfortable. Her good friend Julie had a huge bag packed, hope she is prepared! Next came McKenna...she was so excited. She can't wait to see what the outdoor events will be this year at camp! After the girls picked up their forms they set aside their luggage and belongings and headed for the mess hall to complete the registration forms. Kristen, their camp leader, was there to help with any questions they had. After the girls filled out their forms Kristen told them they could go ahead and make some posters to hang in their cabin if they wanted. The girls decided to all draw pictures of caterpillars and butterflies since that was what they were learning about in Science right before school was let out. What a fun first day of camp activities!! Can't wait to share more with you soon! Oh how cute are these photos!! I just LOVE them. Your dolls are going to have such a fabulous summer. What every summer camp needs......a bunk bed! My dolls go to camp too!